edward and lilly: Giveaway Day! It's Giveaway Day again and this little Baby Owl Zipper Pouch is up for grabs!! PLUS I'm throwing in a couple of badges covered with pretty upholstery fabric. For a chance to win leave a comment on this post or sign up for my newsletter (newsletter subscribers are automatically entered in all my giveaways). And for two entries, tweet, blog or facebook about this giveaway and leave a comment to let me know. Giveaway closes 20 May. Open to anyone anywhere in the world. What a lovely little pouch. Your little stitched owl makes me smile. Oooo, exciting! That little pouch is adorable...fingers crossed! Oh the Hoot is so cute! Love the little owl. I have to say I have one of your brooches (with a little stitched bird) and made the mistake of leaving it attached to a cardi that I threw in the washing machine.....it came out perfect, every stitch intact, so hurrah for great craftmanship!! I would love to be a winner, such sweet items! I'm in ... very cute!! I already receive your newsletter so just commenting to say thankyou for the chance! I just your work and this owl is especially super sweet. I love that little owl. He's totes cute! oops...in my hurry to enter the giveaway I made a mistake! It was meant to read I just LOVE your work! Loving the ink & spindle fabric, the owl sits so nicely on it. I so need one of these for my ginormous purse!! Count me in please! Mememe! I want owl! I'll link to you as well. I love the little owl zipper pouch! It is adorable! Awesome giveaway, count me in. Oh that's so cute! I'd love to own it! Pick me! Adorable bag & great giveaway! please count me in, I'm now a newsletter subscriber! Beautiful bag - love the fabric and the embroidery. That is one gorgeous little owl pouch, beautiful giveaway. Lovely purse! My baby has ripped my old purse to shreds teething so it just so happens I'm on the lookout for a new one... Thanks for the giveaway! Hi! Please count me in!! (Also, thanks so much for your nice comments about the necklace you purchased recently. I hope your mum liked it!!). Adorable pouch! That little owl is too sweet! 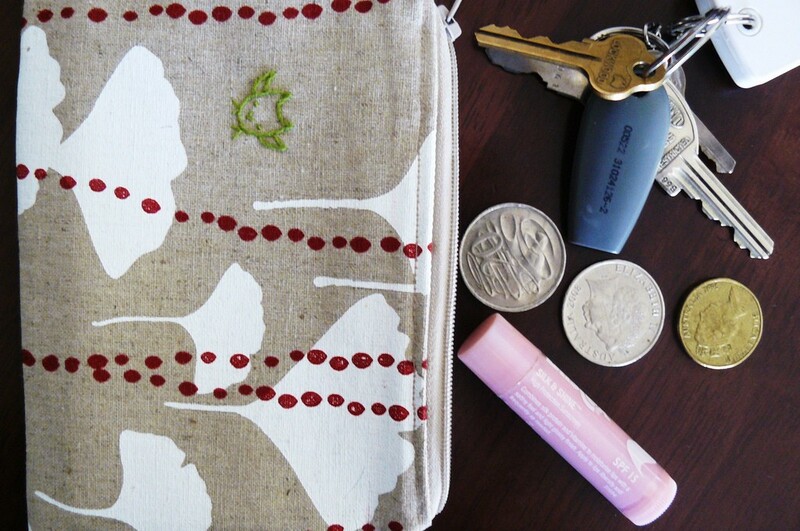 What a lovely pouch - your work is wonderful and your blog an inspiration! Oooh, I would love to win this! You really are the Queen of Embroidery, look how neat that little guy is! pretty darn cute there - my hand is up! That is pure owley gorgeousness! What a perfectly cute brooch! Its such a cute little owl - what a great giveaway, thanks. This is fun isn't it ? What a great little pouch-too cute! Gorgeous pouch, would be great for all the little odds and ends floating around the bottom of my handbag! Thank you ever so much for giving away such an adorable little pouch! Wow! I love your stuff! This is my first time to your blog and I will be back repeatedly!! I also just learned about madeit.com.au (as a Canadian living in Oz, this is a great alternative to Etsy!) Thanks! Too cute! I love your stitchery! I really love the style of your products. quite unique! beautiful pouch! I love the owl. the little owl is so cute! I adore. It's so cute! You gotta love a cute owl. And I do! P.S. love your blog. Now following!! Keep up the aceness. such a cute pouch! thanks for the chance to win. I love it - so cute! What a great little bag! I love the Ginko fabric. They are one of my favorite trees! Thanks for the great giveaway. The pouch is too cute! I tweeted about the giveaway. The owl is adorable! THis is so cute....I love your blog and shop. Thanks for the great giveaway! Signed up...thanks for the chance. Hello from Canada! Love that bag! Great blog, great prize! Love Love Love this bag!!!!! Ooooh I love that ginkgo fabric! Gorgeous! I love your owl stuff. He is too cute. And I have to say the porcupine is adorable!!! CUTE! Love the little embroidered owl for added flare and uniqueness! This is so sweet! I'd love to win this fun zippy, thanks! Stop by my blog for your chance to win a mini quilt! Oh enter me, I would love to win that! The bag is lovely! just FB'ed it too. :) let the deluge of comments commence! LOL! What a very lovely pouch! What a sweet bag - I'd love to enter your givewaway - thank you for the opportunity! Sew generous with such a great give-away! That little zipper pouch is so sweet! I love the little owl! How sweet and understated. Lovely! Oh, cute! Thanks for the contest! Very cute! I love owls. i love the fabric and the baby owl!!! thanks for giving today! What a cute pouch! Thanks for the giveaway! would love to win!! yay for give-away! I would love to win it! Thanks. ahh this looks go cute! Very cute, I luurve owls! this is so adorable! thanks for the chance to win it! Thanks for giving us a chance to win some of your delightful embroidery work! I talked about your give-away on Facebook. Cheers! Love that pouch! Thanks for a great giveaway! what a great little item!! love, love love that gingko fabric! That would look so grand in my bag. What a sweet little owl. Thanks for hosting a giveaway! Holy cow that is cute!... oh is that Holy Owl that is cute! Oh! That is freaking cute! I like the red bubbles! What a cute little bag! Love the little owl. Wow that bag is so cute! I love this owl - it's perfect with it's reduced design ... really cute! What an adorable little pouch....love it! Thanks so much for the giveaway. I love your cute little owl pouch. Thanks for the chance to win it. I love your pouch! Thanks for the giveaway! OK, so I'm drooling over your blog... had to check out your etsy shop... loving everything there... only to find out you are already one of my favorite shops!! eeep!! now I'm really excited I found your blog! 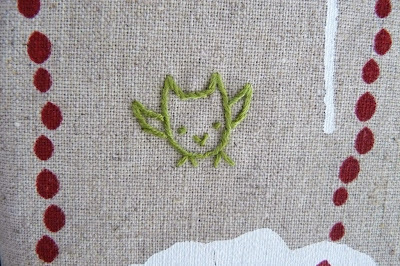 I love that little owl embroidery! What a cute pouch! I know someone (besides myself) who would love this very much. What a cute little bag!! Thanks for the giveaway! Love the little embroidered owl! Fingers crossed!! The owl is adorable!! Thanks for the giveaway! I'm crazy about owls, this little pouch is so cute! Such a cute pouch! Thanks for the chance to win! Love your work!! I'm so glad that I found your blog. You'll be seeing a lot of me here in the future!! I love this bag!! Thanks for the chance to win!! Please count me in! This is too adorable. so cute! Love owls... why are they so appealing? how nice! i could definitely use this little pouch to hold some goodies. That's the perfect pouch!! I twittered for you @moobeardesigns!! I love this little pouch and your embroidered brooches. Fingers crossed so I win. Wow! What a blog of beautiful things. This is so adorable and you have such a beautiful asthetic I am super pleased to have found your space. I will be coming back! oh so cute! you have the best ideas!! i know many of my friends will love your work so i've facebooked your comp too! I absolutely LOVE the bag! I wish I had half the talent you have! !